On a hot July evening at dusk, thousands of people make their way to the quarter acre makeshift (yet somewhat permanent) bus station, approximately twenty kilometres outside of Yangon. The dust and debris from bus engines dating back to the 1960s (at best) plus the chaos of tuk-tuk taxis honking their horns and simultaneously delivering passengers, fills the air with pollution and life. Women and children selling snacks for the journey, weave their way through the rows of busses and hordes of people as they board their bus for the long trip ahead. I am relieved to find we are on a ‘tourist’ bus, that is, without air-conditioning yes, but the overcrowding situation that is most common on Burmese bus rides is waved, and everyone is allocated a seat. Bus travel in Burma is almost exclusively conducted in the dead of the night; whether this is to create ease to long travel times or as a preventative measure for the government to hide their countryside dealings from wandering eyes, I am still not sure. The bus heads off down the infamous government built Yangon-Naypyitaw-Mandalay Expressway, which is one long, straight concrete road, funded by the Chinese government and runs between the two major cities in the country and through the newly established capital Naypyitaw. 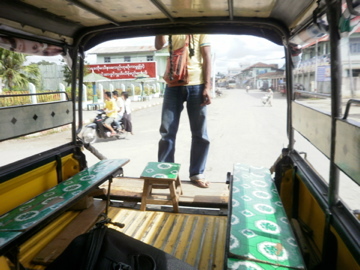 The bus stops frequently once it heads east into the winding hillsides of the Shan State. Stopping ever so slightly on the edge of cliff sides and for longer periods of time each stop. The journey is expected to take approximately nine hours but at 6am after being stopped on the roadside in the one place since 2am, it is clear we are not moving. By 8am, a convoy of local towns people (from which town I am not entirely sure) arrive and into their pickup trucks we get, for the bumpy three-hour ride to our original destination in Shwenyaung. Holding onto dear life out the back of the open truck, my partner sits on the roof with the ‘men’ and all of our baggage. We stop and collect people walking down the highway along the way and at one point I count thirty-two people in what should be an eight-seater vehicle. Finally after being dropped at the main intersection at Shwenyaung where all buses are suppose to arrive, we hail another pick up taxi with some French women and pay our $3USD government fee to enter Inle via Nyaung Shwe. The area is officially home to the Shan and Intha peoples and although in recent times Inle Lake has become something of a tourist hub it still maintains a traditional trading centre for tribes living in the surrounding mountain ranges and alongside the lake. A largely contested region, the Shan State is home to many ethnic rebel groups, warlords and drug dealers who largely conduct business in the hillside towns and villages. It is not hard to find somewhere to stay in the area, with recent spikes in tourism; there is a hotel or family guesthouse on every corner. 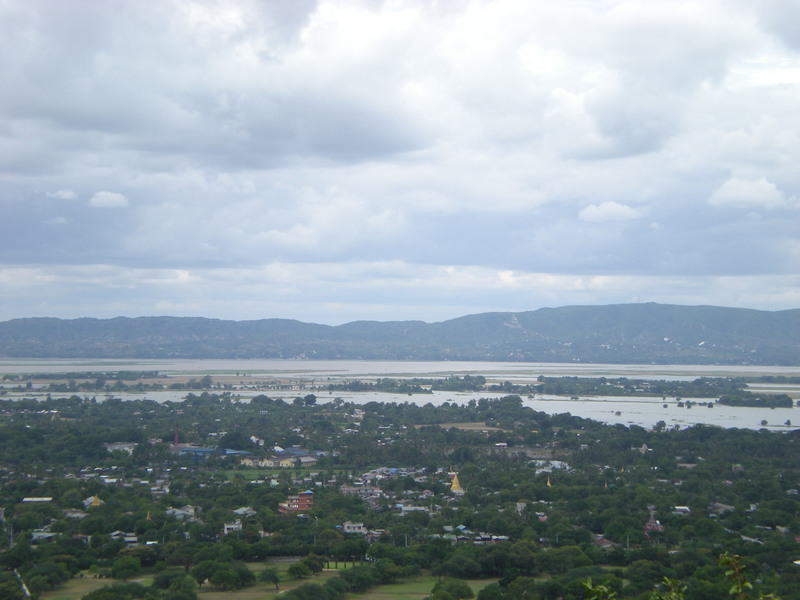 Most people prefer to stay in Nyaung Shwe, which is the gateway town to Inle as prices are more affordable and there is more choice for food and transportation. We decided to stay at the Aquarius Inn, which apparently is also the Lonely Planet’s first choice for accommodation. This quaint, family run guesthouse is an oasis. With cute bric-a-brac rooms scattered amongst a lovely garden, there are several places to chill out in the shade outside of the confines of your room, which provides a great opportunity to meet other guests. With the most friendly and welcoming staff, they offer you free pots of tea and plates of fruit around the clock. The most exciting part of the Aquarius Inn is by far the breakfast. Offering an exciting and different breakfast each morning, waiting to see what will be served each day is cause for much anticipation. Crepes and pancakes one day, eggs any way you like the next and all served with fruit, toast, shortbreads, coffee and tea. It really is a great way to start a morning. 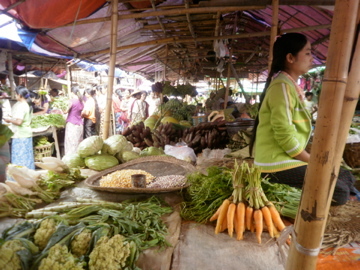 Mingala Markets – full of smells of Asia, fresh food and friendly people. The fantastic food is not exclusive to the guesthouse alone but to Nyung Shwe and the Shan State in general. Shan food is quite seriously the best food in all of Burma, extending further from chicken and rice dishes. Htoo Htoo Aung Chinese & Shan food is the best place to eat in town and its owner (caught on a quite night) provides great insight into the very controversial political situation in Burma. A supporter of the late Aung San, Mr Htoo Htoo is comfortable in expressing his views unlike many Burmese who are frightened and threatened to speak up. Other great places to eat include the Mingala Markets in the centre of town, which provides street food of all kinds from noodles to traditional curries and soups to smaller snack foods of the fried and fresh variety and all cost less than a 2000 Kyat. 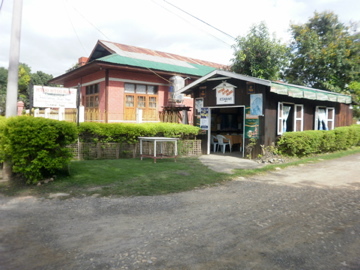 For a fine dining experience, head to Green Chile on the outskirts of Nyung Shwe. The restaurant resembles a beach town resort with carefully crafted wood finishings whilst being surrounded by tropical gardens. The indoor-outdoor restaurant more closely resembled Thai flavours rather than traditional Burmese and for only a few thousand Kyat more than street food, the experience is a great way to escape the hustle of street dining for a couple of hours. During the day there are many activities to keep busy with. Bike hire is very affordable at 1000 Kyat a day. There are many bike trails to take around the area but be prepared for a bumpy ride and a day or two of recovery. The bikes are old and the roads are older but it is well worth the trip to some of the monasteries in the hills, if anything, for the views. Riding the long way around the lake will take a few hours but once hitting the local tribal town of Kaung Diang, you can get one of the local boat drivers to take you and your bike back over the lake. There is a day spa with adjoined springs just out of town but unfortunately they are owned and run by the government where all proceeds go straight to the government. They are however a good maker for several trekking routes, which is also the best place to hike into the lnle area from Kalaw and the only way to avoid the entry fees you pay the government when arriving by bus. On the way home after a long day in the saddle, a short detour via the Red Mountain Vineyard will not be a waste of time. With tours of the Vineyard followed by a very cheap taste testing session on the deck, the views of the lake are priceless. During the Full moon most cafes, restaurants and markets are closed so it is a good opportunity to head out into the surrounding mountain ranges for a hike. There are many short three to five hour round trip hikes with temples and native attractions such as many in ground caves that don spectacular carvings and very large bats. Many of these caves are carefully watched over by elderly monks who will happily take you for a ‘tour’ and offer you roti in their nearby homes for a small fee. 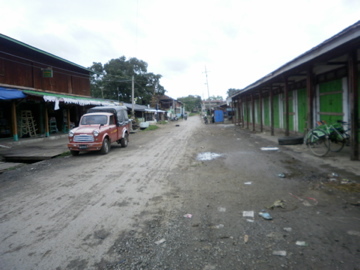 Despite being a backpacker haven, most places around town close up very early and it was suggested by many guesthouses in Nyaung Shwe that guests return by a 10pm curfew as many lock the front gates to prevent stray dogs and passerby entering the premises. Although it is hard to feel threatened in such a serine and uplifting place, we played by the rules and returned to the Aquarius Inn to enjoy a few heavily taxed drinks and chat with fellow travellers from the garden of our pleasant guesthouse. Since the 1960’s the area has been rife with political and civil conflicts and although tourists, like in the rest of Burma are relatively safe, it is possible to get caught up in local political clashes between rival tribal groups. 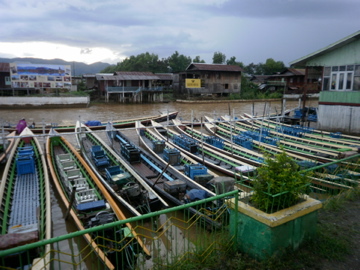 The off season can be difficult for some tourist activities such as boat travel to the floating markets on the lake as canoe owners and drivers often hike up the price to 20,000 Kyat when usually the fair is around 9,000. If your guesthouse staff offer to help you with this negotiation take them along to assist. They will usually cut a nice deal with a friend but the deal will be fair and affordable for tourist prices. In high season, travelling to the floating markets is much easier and for smaller groups, joining forces to hire one boat for the day is an ideal way to see the lake area in a few hours.